In our Cooker category you will find 50cm cookers, 55cm cookers & 60cm cookers. Our extensive range of appliances are available for Natural Gas, Bottled Gas, Dual Fuel & Electric. Cookers There are 36 products. 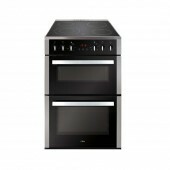 Electric cooker 55cm Newworld Etcblk Electric cooker with seperate grill. Newworld freestanding cookers.Whether it’s conventional, fanned, gas, electric, wipe clean or energy efficient, you’ll find it in our freestanding collection.